An Icy Mission Leads to Dangerous Times. Part twenty takes us from the original “Eclipse Celestial Spirits” Arc to the super “Tartaros” Arc that takes the Fairy Tail wizard guild on a dangerous ride that threatens the whole of their world. After the battles to get all the Celestial Spirits back to normal and once again coupled with Lucy and Yukino they take time to relax in their new Guild Hall as the girls and boys luxuriate in their respective hot baths. The boys listen in to the girls chatter and are flabbergasted by what they hear. The girls spot what they think is Erza alone at the other end of the bath, but they are amazed when she turns around to see that it is Flare from Raven Tail, who tells them that they have disbanded. 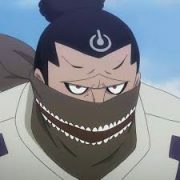 Flare has always had a thing about Lucy, so everybody is stunned when Flare refuses Lucy’s invitation to join Fairy Tail. 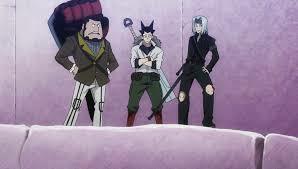 Ever since their win at the Grand Wizard Games the guilds work load has increased a lot and everybody is out on jobs but Natsu and Gray are overdue on their mission. The usual gang are amazed that the bickering pair would even go on a job together, and they decide to go investigate with ideas that the pair may be growing up a bit. But no, when they find them the pair are at it as usual and when Erza goes to break it up, OOPS! Bad mistake for the fire and ice boys. Even though the pair swear to work with each other again they receive a job offer from Warrod Sequen, the fourth highest ranking Wizard Saint, how can they refuse. The group go to see him and he tells them of a village far away that has been totally frozen along with all its inhabitants and their deity the ‘Eternal Flame’. They take the job and he transports the gang on a fast moving tree to the village. It is true the village is covered in ice but it isn’t normal ice as Gray examines it. Whilst discussing what to do they come across treasure hunters from the Sylph Labyrinth guild who will do anything to get treasure even if that means really annoying Fairy tail, their mistake. 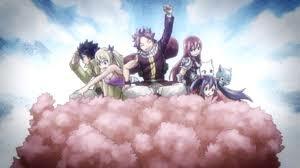 The gang split up to search for the eternal flame, Natsu, Gray and Erza go their separate ways leaving Lucy, Happy, Carla and Wendy to fend off the treasure hunters and when they think they are about to die Flare shows up and saves the day. She reveals that she grew up in Sun Village along with the Giants. Also at the village are two dark guild members Doriath and Minerva of Succubus Eye. Doriath has the Regression ability that can turn you into a youth and reduce all your abilities. 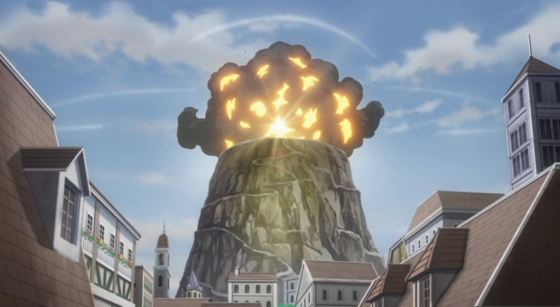 Erza is the first to encounter this, as a vengeful Minerva confronts her and wants the death of Erza, whilst Natsu comes across Doriath while he is looking for a voice he heard in the ice. Gray also encounters the monstrous Doriath, but Gray has the smarts to get the better of him. 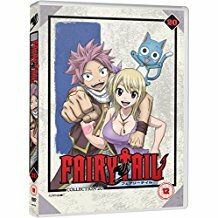 This adventure leads to a much more serious trial as the “Tartaros” arc begins as the demon guild start a mission to gain control of a weapon of total destruction, and Fairy Tail is a thorn in their side. Fairy Tail find out that fighting a Demon is nothing like fighting another wizard as our team fight to save what is left of the wizard council. Brutal stuff.